Coach Shaffer is in his seventh year as head coach of the Hornets, and is in his ninthth year overall. Coach Shaffer started coaching in Wellsboro at the Middle School level as an assistant coach, and spent two years as the assistant girls soccer coach. 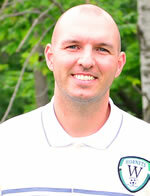 Coach Shaffer is also in his sixth year as a club coach through the Soccer Training Network. Coach Shaffer also participates in soccer camps through STN and Clarion University, and holds a USSF national "D" soccer coaching license. Coach Shaffer is originally from Jersey Shore, PA and moved to Wellsboro five years after graduating from Kutztown University. Coach Shaffer teaches history at Wellsboro High School and lives in Wellsboro with his wife Morgan. Boys Soccer team holds annual banquet. Coach Shaffer announces Parent Meeting. Shaffer announces boys soccer parent meeting. Hornets fall to East Juniata in D4 soccer semifinals. Worthington PK lifts Hornets over South in OT. Hornet soccer ties Troy, 1-1. Coach Shaffer to hold Parent Meeting. Mitchell to play soccer at Keystone College. Hornet Soccer eliminated from Districts with 2-0 loss to Sayre. Hornet Soccer shuts out Williamson, 2-0. Hornets fall to Sayre 1-0 in double OT. Hornet Soccer shuts out NEB, 3-0. Hornet Soccer tops Sayre, 1-0. Hornet Soccer shuts out NoPo, 1-0. Boys soccer rallies to down NoPo. Hornet soccer beats Troy, 2-1. Boys soccer tops NEB, 3-2. Boys soccer falls to Sayre, 1-0. Boys soccer tops Williamson in 2OT. Boys soccer team shuts out Galeton. Boys soccer falls to Troy, 1-0. Boys soccer drops Liberty, 2-1. Boys soccer falls to Troy. Boys soccer tops Williamson, 2-1. Boys soccer falls to NEB, 1-0. East Juniata too much for Wellsboro. Worthington's OT goal leads Hornets past South Williamsport. Troy boys tie unbeaten Wellsboro. Sayre uses quick strikes to beat Wellsboro 2-0. Sayre holds on over Troy.